H. E. Yahya bin Said bin Abdullah Al-Jabri, Chairman of the Special Economic Zone Authority in Duqm (SEZAD), signed the second package for Construction of Roads, Infrastructure & Buildings At The Commercial Terminal And Operational Zone Areas, PORT OF DUQM (IP2), Mr. HUNKAR ADALI – Chairman, SERKA and Mr. TIAGO FORTUNATO – Vice President, MSF signed the agreement on behalf of the executing joint venture SERKA-MSF. H.E. Yahya bin Said bin Abdullah Al-Jabri, Chairman of SEZAD, expressed his pleasure with the signing of agreement in the midst of the country's celebrations of the forty-sixth National Day. “I am honored to convey to His Majesty Sultan Qaboos bin Said - may Allah protect him – the congratulations on the forty-sixth National Day,” Al-Jabri said in a press statement praising the achievement in the Sultanate during the years of the blessed Renaissance and stressing that SEZAD is one of these achievements that aim to realize the welfare of the Omanis. He explained that the second package of Duqm Port includes the most important operational facilities for the commercial wharf and it will allow the commercial operation thereof. He indicated that the Port is among the most important prime movers of SEZAD and one of the strategic projects implemented by the Sultanate to support the national economy and activate economic movement in the Sultanate in general and Al-Wusta Governorate, in particular. The second package of Duqm Port is one of the most prominent projects at the Port with a cost of OMR 107.3 million. construction period shall be within 30 months from the commencement date in addition to 30 days for preliminaries. This package includes the construction of four terminals on the commercial pier, including two for containers of about 1,600 meters long and 350 meters’ width to handle about 3.5 million TEUs annually. There shall also be a terminal for dry bulk terminal with a capacity of about 5 million metric tons per year and versatile terminal with a capacity of approximately 800 thousand metric tons per year. The second package also includes construction of the port operations area. The project will be constructed by the joint venture of Turkish SERKA Company and Portuguese MSF Company, which both expressed their pride to participate in the development of SEZAD through the implementation of the second package of Duqm Port project. Both companies possess a strong track record of realization of challenging projects in the region and elsewhere in the world. 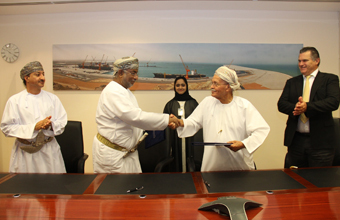 The two companies have confirmed their commitment to construct the project on time, saying in a joint statement: “Through our journey to become the leading contractor in the Duqm Special Economic Zone that began some 2 years ago, we have understood the importance of Duqm for the economy of Sultanate of Oman. It is apparent that having the port fully operational within the stipulated time will pave the way for new investments and will transform it into a significant economic value instantly. Hence SERKA-MSF Joint Venture is committed to complete and deliver this vital project in a timely and a perfect manner, within budget. Under the agreement, SERKA-MSF Joint Venture will establish a number of buildings in the operation area, commercial terminal, dry bulk terminal, and container terminal. There shall also be a two-way road of 3 km along with internal roads. They shall also supply and install traffic lights and parking lots for the commercial terminal, portable water connections, firefighting systems, water pumping stations, street lighting, and infrastructure for communications services and work on improving the ground, supply and installation of two types of highly secured fences and many other works.